Well this came as a special request from Sushil, but I think this review should have come earlier after a very learning experience!! So, as they it's better late than never..... so, here goes the review of Sushil's LML Freedom 110. 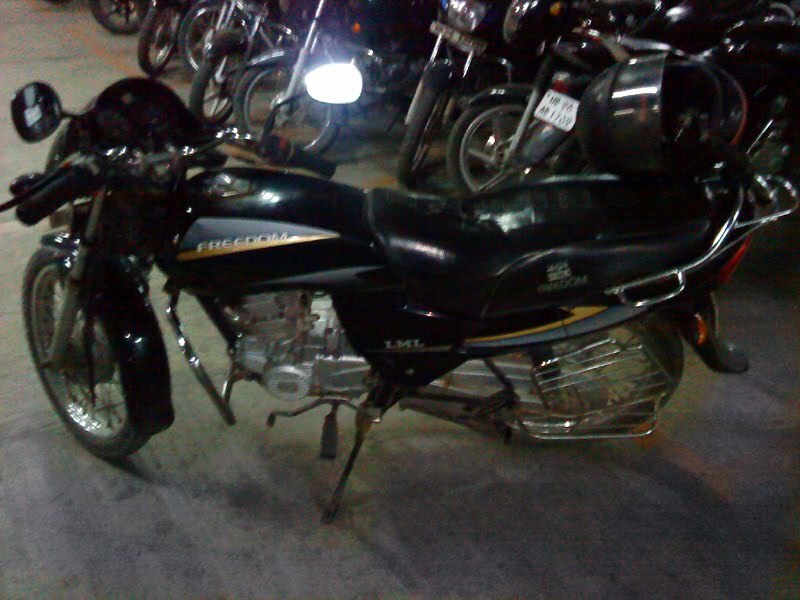 Compared to the current 110 cc commuter bikes that we have in India, this 2003 machine has comparable power band. For example, take the case of the newly release Barbie Doll from Honda... the CB Twister 110, which produces a peak power out put of 9bhp at 8000 RPM, which comes down to almost the same figure the Freedom bangs out. A 9.0:1 compression ratio is quite decent enough for a 110 cc machine which converts very well in the pick up department. It's a very avid wheely machine and I mean it. On first gear, if you are getting a bit too, freaky with your right wrist, the front wheel does have a tendency to kiss the sky with out much effort. Look wise the Freedom is not bad either for focusing on the commuter image the bike focuses on. The stickering and the paint quality is good and after seven years of ownership and in-spite of the fact that Sushil is not that crazily fanatic about maintaining his machine, the machine has held it's composure quite well. The shine of the paint hasn't much faded away and still looks in good shape. There are little itsy bitsy rusty patches near the handle bar area but that shouldn't be much of an issue. The big trapezoidal head lamp does the job of illumination quite well. Though I was not able to check out quite much of the illumination power of the head lamp, but still, for 110cc bike it was quite well. The instrumentation cluster is pretty much standard with the left lob hosting the Speedo and Odo and the right lob featuring the Fuel gauge and the required indicators. The kick is very smooth and required almost negligible effort to crank the engine. The engine idling is quite smooth and quite. The sitting posture is copy book commuter. I personally felt that the handle bar was a bit more higher than normal. Generally while trying out any bike, I try to judge how much kick the engine has and accordingly I engage the first gear for motion. So, I engaged the first gear and blipped the throttle and clutch a bit and the bike almost leaped forward. Boy this puny engine does has some serious kick, and given the low kerb weight of the bike, the kick feels all the more. The rest of the ride was pretty much standard. I felt, the rear disk was a bit too feeble for my comfort and same was the case with the front break. Anyways it was perfect for Sushil and that's what matters the most. In order to not to allow the rider to take the bike into motion, while the side stand is down, there is a small latch provided with the gear lever, which doesn't allows the rider to engage the gear while the side stand is down. Pretty smart and cost effective move to achieve what other would have done with some costly sensors and ECU mapping. Well there are nothing much to complain here about, but I definitely felt that the gearing needs Clutch Plate change, because in lower gear at lower speeds, the bike was jolting and there was no smooth movement through the shifts. Sushil said that all through the years of ownership of around Seven years and 50K km plus of ride, the clutch plates are still stock. I think it's high time to get clutch plates done, because what I felt through the shifts, the gear box is definitely rattling. Oil is leaking from the Engine head, which needs to be taking care of quickly. Such things can greatly affect the ride quality and the overall performance of the bike. Looking at the position of the oil leakage, it seems that the leakage might also be seeping into the combustion chamber causing more damage. So, for the next service, this should be the first priority. 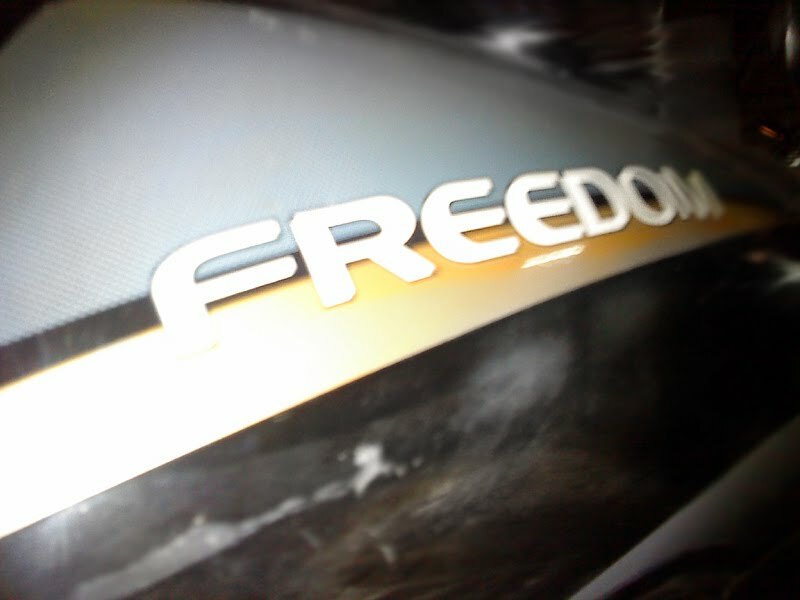 "Freedom", the only LML bike which had showed promise for LML. The other 125 and 150 cc models had flopped badly.. possibly resulting in the company shutting its operations. Really I had different perceptions for LML bikes, because I didn't liked the looks of them. But now after riding Sushil's bike, I think I should have ridden the rest of the LMLs too :). Guess by the time I developed the passion for bikes, the company was done with bikes.